Glucosamine Sulfate is a biological chemical that is naturally present in bone cartilage, where it forms the major cushioning ingredients of the synovial fluids of the joints and surrounding tissues. As its name indicates, glucosamine sulfate is composed of a sugar molecule, glucose, and amine group and a sulphur salt. 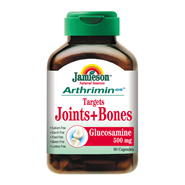 Each caplet contains: Glucosamine Sulfate 500mg.